The rich color of a copper backsplash will add an elegant look to any kitchen. If you've ever considered installing a backsplash made of copper, but are worried about the upkeep, fear not because this type of backsplash can be easy to maintain. When coated with a lacquer, a backsplash made from copper will resist tarnish and fingerprints. A backsplash made of copper can consist of tiles installed individually or large panels with tile patterns already embossed onto the sheets of metal. Designs on copper range from simple geometric patterns like diamonds or brick, to more elaborate designs. Copper can either be smooth and sleek or have a textured surface. The latter, known as hammered copper, is a popular choice for kitchen backsplashes as it brings a rustic and authentic look to a room. The natural element of copper is a golden-brown metal that changes color with age. The color of copper will add a warm, rich look to any kitchen. Left in its natural state, copper will oxidize over time and develop a patina. Some people prefer the look of shiny new copper and opt for backsplash metal that has been coated and sealed with a lacquer glaze to keep the color from changing. The color of aged copper (before it reaches a full patina) can also be locked in with a glaze or coating. Copper works well with various kitchen styles, ranging from modern and contemporary to rustic and vintage. Copper, like other metal backsplashes, can be embossed with a decorative pattern or motif. The color and texture of this metal is versatile and works well with various kitchen styles ranging from modern and contemporary to rustic and vintage. 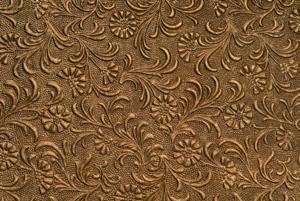 Copper, like other metal backsplashes, can be embossed with a decorative pattern or motif. New copper has a polished and shiny appearance, like a brand new penny. Over time, raw copper tends to tarnish and become darker. The color will develop into a warm reddish tone, like that of an old penny. When copper is exposed to humidity or water, it will turn a blue-green color. If you like the greenish-hue of aged copper, opt for unsealed metal or copper without lacquer. Because copper is considered a soft metal, it is prone to the occasional dent or ding. Avoid this problem by choosing a thicker, heavier weight copper. Clean lacquered copper with a soft cloth that has been slightly dampened. It is okay to use a mild detergent, but avoid harsh cleansers or abrasive cleaning solutions. Remove tarnish from unfinished or unlacquered copper with a combination of vinegar and salt or lemon and salt. Mix the salt with the vinegar or lemon to make a paste. Wipe the solution away with a damp cloth and buff the metal until it shines. MetalPeddler.com is the online store of The Metal Peddler, Inc, based out of West Sunbury, Pennsylvania. They specialize in various copper home accents including backsplash metal, sinks, pot racks, mailboxes, countertops and range hoods. Depending on the type of backsplash you buy, installation techniques may vary slightly. With clear instructions, you can install this kind of backsplash yourself. If you have any doubts, consider hiring a local home improvement contractor to install the backsplash for you. A properly installed and cared for copper backsplash will look beautiful for years to come.